A number of observations point to the presence of liquid water and water ice in Gale Crater in the past (Fairén et al., 2014). 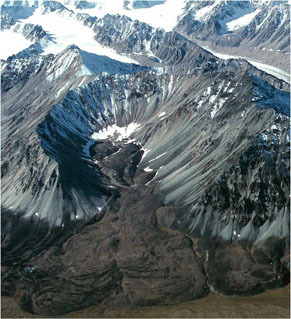 The crater shows an ancient lobate rock-glacier complex in parts of the northern central mound (Image 1), and large valley systems towards the southeast central mound. A series of interconnected canyons, channels and possible lake basins record fluvial and lacustrine activities on the crater mound and floor. Very cohesive ancient river banks, incised and inverted channels, eskers (Image 4), lobate fans/deltas, superimposed fans, drumlins, and polygonal patterned ground on the crater floor indicate wide expanses of ancient ground ice. Image 2: Glacial valley incising the south-eastern lower slopes of Aeolis Mons. 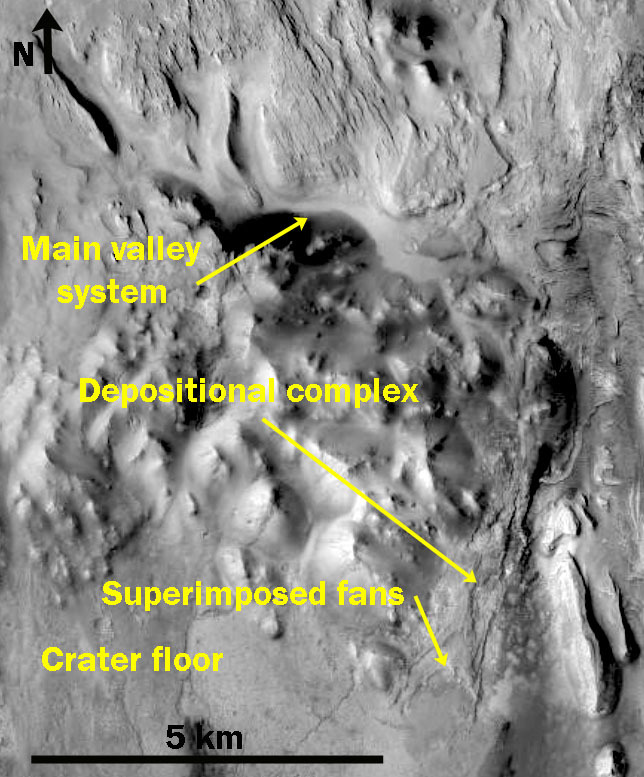 The image includes details of the superimposed fans in the terminal depositional complex. Ancient rock glaciers, ground ice, rivers and partially or totally ice-covered lakes in the Gale crater basin point to past glacial and glacio-fluvial environments that represent the components of an ancient cold hydrological system, probably a local expression of the “cold and wet” global environment that characterized Mars in the past (Fairén, 2010). The ice that accumulated on Aeolis Mons would have supplied the rock glaciers and also would have been a convenient source of the liquid water for carving the canyons and channels (Image 2). Water collected on the floor of the crater forming lakes and ice-covered lakes would have had its most obvious source in the snowmelt water carried by canyons and rivers. Image 3: Oblique aerial photograph of an unnamed rock glacier (approx. 1 km wide within the cirque) located on the southeast side of the Talkeetna Mountains, Alaska. Once rock glaciers extend from the confines of their valley head, they form a deposit that is higher than the surroundings, similar to the Gale lobes in Image 1. 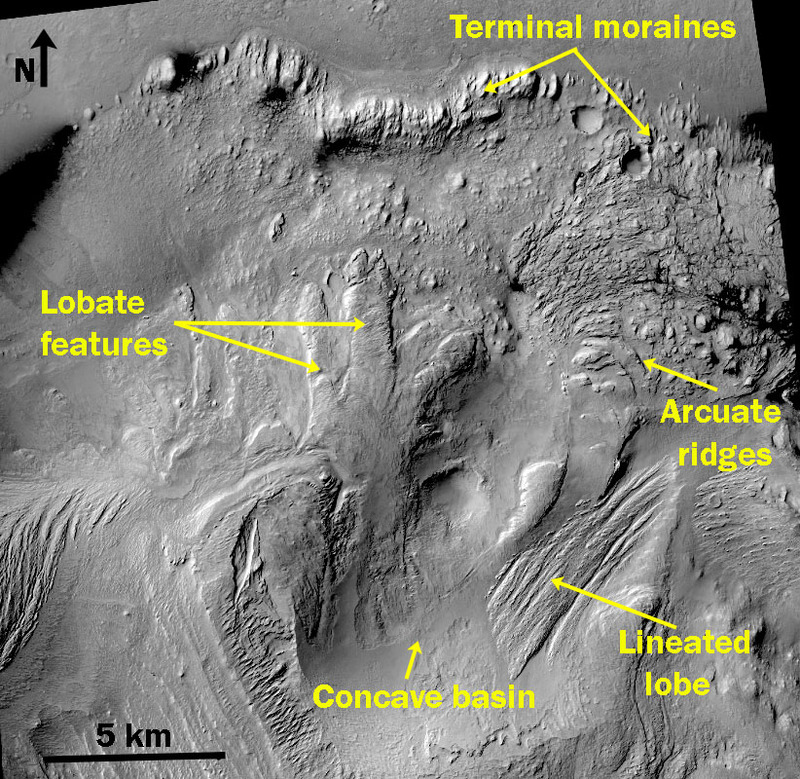 Glaciers on the top of Aeolis Mons could have contributed to protect the central mound of Gale against erosion, as has been recently proposed to occur on terrestrial mountaintops covered with glaciers (Godon et al., 2013), (Image 3) contributing to explain the differentiated preservation of the 5-km high Aeolis Mons. 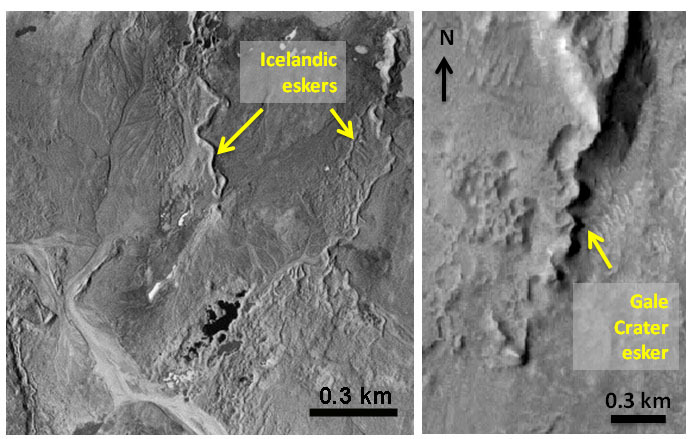 Image 4: Eskers emanating from the margin of Breiðamerkurjökull, in Iceland; and close view of a sinuous ridge in the terminal depositional complex shown in Image 2, a possible esker in Gale. The generally degraded state of the northern rim of Gale (vs. the southern) suggests either a lowlands ocean lapping up against the dichotomy boundary and the northern walls of the crater, or glaciers occupying the dichotomy boundary at the Aeolis Mensae region and eroding the northern rim of Gale. Following the liquid water- and water ice-enriched environment period, a time of drying generated the polygonal patterned ground and developed the dune fields, and eventually the surface liquid and frozen water disappeared from Gale. Anderson, R. B., J. F. Bell III, 2010. Geologic mapping and characterization of Gale Crater and implications for its potential as a Mars Science Laboratory landing site. Mars 5, 76-128. Cabrol, N. A., E. A., Grin H., Newsom, R. Landheim, C. P. McKay, 1999. Hydrogeologic evolution of Gale Crater and its relevance to the exobiological evolution of Mars. Icarus 139, 235-245. Fairén, A. G., 2010. A cold and wet Mars. Icarus 208, 165-175. Fairén, A.G., Stokes, C.R., Davies, N.S., Schulze-Makuch, D., Rodríguez, J.A.P., Davila, A.F., Uceda, E.R., Dohm, J.M., Baker, V.R., Clifford, S.M., McKay, C.P., and Squyres, S.W. (2014). A cold hydrological system in Gale crater, Mars. Planetary and Space Science, in press. Godon, C. J.L. Mugnier, R. Fallourd, J.L. Paquette, A. Pohl, J.F. Buoncristiani, 2013. The Bossons glacier protects Europe’s summit from erosion. Earth Planet. Sci. Lett. 375, 135–147. Malin, M. C., K.S. Edgett, 2000. Sedimentary rocks of early Mars. Science 290, 1927-1937. Wray, J. L., 2013. Gale crater: The Mars Science Laboratory/Curiosity rover landing site. Int. J. Astrobiology 12, 25-38.